If it can’t be found on Google, it doesn’t exist. If you can be found on Google it means you will never get headhunted and offered a better job. Today it is a must to create your own online resume. LinkedIn might be enough for resume, however, you still need your own portfolio to showcase your work. Below you will find the best of the best vCard WordPress themes designed for easy setup and administration. Most of these themes have unlimited color variations or at least several color schemes for you to choose. I guess you will have a hard time to choose one theme that you want to use because all of them are awesome. Gone are the days of outdated business cards. In today’s high-tech environment, your website will be your business card. A top quality vCard site must be able to showcase relevant information, while maintaining a visually appealing design. Images can be included, and they will automatically resize and adjust in order to fit any screen. This allows them to be displayed on devices such as tablets and smartphones. In addition, users who purchase Uncode will be able to enjoy some of the best premium plugins on the market, free of charge. You can save a total of $86, due to the inclusion of iLightbox, Slider Revolution and Layer Slider. Each of these add-ons can expand your vCard site’s capabilities, resulting in a superior browsing and customization experience. For new users, a detailed documentation source was added. It explains every feature in detail, offering to turn you into an overnight expert. With this theme, every vCard page will manage to capture the attention of employers. Thanks to the inclusion of Drag and Drop technology, you will be able to craft astounding layouts with ease. There is no need for advanced programming knowledge, given that Uncode is extremely user-friendly. For more information, be sure to access the live preview. Massive Dynamic is a visually stunning and deeply configurable, astonishingly modern and engaging, highly interactive and marvelously versatile and flexible, tech-savvy and incredibly intuitive, highly responsive WordPress business and corporate multipurpose website builder. Massive Dynamic has been developed by a dedicated team of professional developers and graphic designers, working together to produce a well matured, highly intuitive, polished and perfected, functional platform for webmasters from all walks of life to easily and effortlessly construct impressive, commercial quality websites across a vast number of business and professional fields and industries. With a host of helpful, time-saving templates and demo websites readily deployed through one of the simplest and most intuitive import systems on the market today, getting started with Massive Dynamic is easy and breezy, while fully customizing the look and feel of your website with the Live Website Builder has never been this precise and streamlined. Over 70 shortcodes are readily available for your convenience. A beautiful, professionally designed vCard template will let you set up your online curriculum vitae or vCard within minutes, in the most modern presentation possible, with styles and animations to impress the most demanding employers. Suit up and get ready to make a solid impression, with Massive Dynamic! Kalium is a modern and classy, creative and elegant, fresh-faced and professional, highly responsive WordPress creative multipurpose, portfolio and online shop website theme. Kalium has been built on a rock-solid platform as a tool for creatives, professionals, organizations and individuals in general to effortlessly put together the most sophisticated modern websites in a matter of minutes, without ever having to write a line of code. Kalium is built around the incredible Visual Composer page builder and its intuitive drag and drop interface. Combined with the premium Revolution Slider and LayerSlider, crafting gorgeous websites is a breezy task with Kalium. A generous collection of demo websites makes initial setup painless and uncomplicated, while portfolio layout and style configuration capabilities, along with a whopping 30 portfolio templates for you to pick from, make Kalium a solid ally to all professionals trying to get their work noticed by employers or clients, with a wealth of customizable features and functions to your spotlight fits your work’s tone and style just right. Kalium’s powerful and cutting edge vCard templates make sharing your professional resume a simple matter, with functional download and social sharing features so the word spreads all the quicker to the right people. Try Kalium now! FatMoon is a purposeful and ambitious, vast and comprehensive, easy to use and very intuitive, rapidly responsive WordPress creative photography multipurpose website theme. FatMoon has been created as a solution for webmasters with or without previous development experience, empowering them to effortlessly put together the most amazing, sophisticated, modern websites on the market today in a matter of minutes, without having to write a single line of code. With 41 general and specific conceptual demo websites, you’ll always find the right fit for your project, regardless of its nature or tone. Professionals love using FatMoon to give a creative, meaningful presentation to their resume websites, CV websites, online portfolios and similar, related projects. FatMoon knows just how to make your content pop, and when your content is your professional output, clients and employers are bound to appreciate your work displayed over enthralling Parallax hardware-powered backgrounds and HTML5-powered video backgrounds, on top of FatMoon’s professionally composed layouts, image gallery and portfolio templates, which you can customize to your heart’s content within instants through the premium drag and drop Visual Composer page builder plugin, as well as spruce up with the Slider Revolution premium slider plugin. Get the word out there on your feats, with FatMoon! Bateaux is a colorful and youthful, fresh and modern, professional and unassuming, fast and readily responsive WordPress creative multipurpose website theme. Bateaux is the result of a laborious design process by a dedicated team of designers and developers aiming to create a streamlined, seamless platform that empowers users from all backgrounds to effortlessly put together amazing websites in a matter of minutes, without ever having to so much as peek at a line of code. Bateaux is a perfect theme for webmasters with or without previous coding skills who need to efficiently put out professional quality content in a short timeframe and with deep-seated functionality. Bateaux is loved by professionals the world over, who find in Bateaux a strong ally in presenting their professional resumes to potential customers or employers within massive online audiences, through the intuitive Blueprint drag and drop page builder, developed in-house to offer an app-like admin-user interface that makes short work of most design and development tasks. Plentiful social media integration features and widgets are present within Bateaux for your convenience, and thoroughly documented as well. With Bateaux by your side, you’ll always make the right first impression coming in through the door. Try Bateaux now! Brando is a handsome and professional, easy to use and highly dynamic, engaging and readily responsive WordPress single page multipurpose website theme. Brando is a simple and streamlined single page website theme designed for webmasters of any skill or experience level, with or without coding knowledge, empowering them to put together functional modern websites across a spectrum of applications and website archetypes in elegant single page presentation and with a myriad of sophisticated, modern features to boot. Brando is packed with page templates and homepage demo websites for a myriad of specific and general purposes, though it shines particularly brightly when deployed as a professional vCard website theme. Brando’s sleek single page presentation and honed design aesthetic make it a perfect candidate for professionals to easily introduce themselves to the world and potential clients or employers in a serious, clean-cut, professional spotlight that makes a lasting impression. With extensive portfolio capabilities under the hood, Brando can furnish your works and accomplishments with an enticing framework for showcasing them to your audience, with multiple navigational styles, animations, transitions and opportunities for fine-tuning and branding. Market yourself effectively with Brando’s potent SEO enhancements, and you’ll get noticed in no time at all. Try Brando now! Incubator is a modern and seamless, elegant and stylish, professional and purposeful, intuitive and highly responsive WordPress startup business website theme. Incubator has been crafted by a team of experienced graphic designers and coders seeking to provide webmasters from all walks of life with a full-featured framework that empowers them to create their unique, highly customized and fully functional websites in a matter of minutes, no coding required at all. Making use of both user-friendly visual interfaces for layout and element customization and edition, as well as an incredibly potent and robust admin back-end framework based on the incredible Redux Framework, Incubator gives you all the power of the latest web development technologies with none of the hassle. Professionals love Incubator because it allows them to effortlessly create their own personal digital portfolios to showcase their previous work or finest accomplishments, it integrates numerous necessary modern features such as social media sharing capabilities with custom buttons and animations, amazing smooth scrolling owing to hardware-powered Parallax technology, complete native mobile-friendliness and cross-compatibility powered by Bootstrap, and far more under the hood. vCard websites benefit from Incubator’s sophisticated digital downloads features as well as convenient demo websites. Try Incubator today! Empathy is an incredibly sleek and aesthetically minimalist, subtle and understated, delicate and professional, purposeful and innovative, modern and creative, colorful and personal, engaging and easy to use, highly customizable and extremely streamlined, intuitively structured and very swiftly responsive WordPress personal vCard website theme. Empathy is a soft-spoken and canderous theme that has been exclusively designed with the intent of revolutionizing the exchange of professional vCard information through web-based mediums. Ambitious in its conception, vCard delivers a streamlined and pure-minded theme that is spectacularly simple to customize through the WordPress Live Customizer, with hundreds of advanced configuration options and choices at your disposal for crafting sublime, detail-oriented, precise and professional quality vCard websites in a flash, without having to write a single line of code, regardless of your background or previous experience. Empathy includes several blog styles with support for all post formats, and a collection of over 67 unique page transition animations to give your website a unique, distinctive feel. Flexible handling of image and video comes naturally for Empathy, while a host of custom widgets includes Flickr, Instagram, Picasa and more, as well as over 30 popular social media icons and 600 Google Fonts accessible through the WordPress Theme Customizer. Get some Empathy today! Kallyas is a sleek and responsive WordPress creative multipurpose website theme. Kallyas is an intuitive framework for developing engaging websites without any coding at all. Business, personal and professional applications are all within its wheelhouse. With tons of demo websites and template pages, there’s nothing Kallyas can’t do. Kallyas is ideal for professional users that need a robust solution for online presence. With effective SEO tools at your disposal, Kallyas can help your website get noticed. And with a ton of interactive and engaging features, visitors are in for a treat. Stunning slideshows and gorgeous portfolio showcases await within Kallyas. Convenient vCard templates allow you to easily market your professional capabilities to potential employers. You’ll always make the right impression with the highly customizable visual interface. Dozens of portfolio customization settings await within Kallyas. Kallyas has hundreds of possible combinations and over 100 elements to play with. You can drop contact forms, carousels and gallery grids into the action with a few clicks. Kallyas is responsive and compatible with all platforms and devices, thanks to Bootstrap. The Smart Loader makes your vCard websites lightweight and efficient. With Kallyas at your side, you’ll land the job in no time at all. One Page Pro is a multipurpose WordPress theme focused of professional websites settings. It has 3 great demos from which you will find one dedicated to CV/Resume aspects. It uses +100 Google Fonts and even allows to upload you own fonts on certain formats! One Page Pro is a hundred percent responsive and adaptable through screens. It offers numerous layouts for blogs, portfolios and galleries reaching more than 30. Build things quickly with powerful Drag & Drop and a little help from Ajax. Play with the unlimited color skins and its wrapper. One Page Pro uses premium features like Revolution Slider, iLightBox, WooCommerce and WMPL. It is a practical, dedicated thing with a oriented design. You will find specialized features on demo, like a smooth menu that leads you to aspects of your work. Layouts become the background with a beautiful and subtle overlay. Everything is made for single posts modules and simple scrolling. Have fun arranging between a large amount of customized headers and footers. Introduce social media icons and links with its discrete top bar! One Page Pro is well documented, and includes its own custom support team. It allows up to 8 formats to upload and customize posts! Fast and easy thanks to SEO! Beoreo is a modern and dynamic, professional quality and very polished, easy to use and intuitive, highly responsive WordPress creative multipurpose website theme. Beoreo has been designed and implemented as a spectacularly easy to master platform for the creation of sophisticated, creative and memorable websites for professional, businesses and agencies that want to get their name out there with potential clients and customers, while getting their work recognized and advertised online in a captivating fashion, and simultaneously introducing themselves, their professional qualifications and services, all in a single, sleek presentation that is both seamless and minimalist while unique and customized. Meet Beoreo. With over 18 different, professionally graphically designed homepage demo websites, dozens of header, footer, sidebar, pagination and navigation possibilities, an unobtrusive user interface that puts content first and keeps users focused, and dozens of shortcodes and elements exclusively for your professional convenience and ease in communicating your accomplishments, previous experience and current service fees and packages, among many more, Beoreo is the best and last introduction card you will ever require as a professional. With top of the line SEO enhancements implemented at every level of code, Beoreo is quick to make a dent in your traffic and, ultimately, your overall business. Try it now! Kameleon is a beautiful and engaging, easy to use and extremely flexible, visually stunning and highly responsive WordPress creative multi use website theme. Kameleon has been equipped with a cutting edge set of tools, features, shortcodes, plugins and widgets that make it one of the most powerfully pliable themes on the market today, capable of bending over backwards to suit your every graphical requirement and layout styling choice. With tools like the premium Visual Composer drag and drop page builder, the Revolution Slider slideshow builder, a stunning Contact Form 7 Live Builder and the WP Live Customizer, there isn’t a thing about Kameleon that you can’t wholly customize to suit your branding requirements, without ever having to so much as see a single line of code. Kameleon is perfect for professionals in need of a solid platform to disseminate their personal resume or CV from, a dedicated website that showcases their professional skills and accomplishments in a trustworthy, clean and presentable fashion that appeals to potential employers or clients and effectively reels in new business. With handsome sets of thousands of Line Icons and Icon Fonts, endless color possibilities, dozens of creative layouts and beautiful CSS3 animations, Kameleon will always ensure you make the right first impression. Try it today! Morgan is a surprisingly intuitive, visually stunning, professionally polished, highly responsive WordPress resume, vCard and personal portfolio website theme. Morgan is a newly minted, fresh faced website theme that has been crafted to empower webmasters from all walks of life to successfully present themselves to the world at large in an attractive, streamlined, modern presentation that is both simple and elegant. Putting together a fully functional website with Morgan will take you under half an hour, with intuitive page by page importation processes to produce the exact look, feel and hierarchy you envision. With a selection of five different homepage styles, you can greet your visitors in different tones to suite your business, while five header and three footer styles ensure your website is unique and expressive of your identity. Visual Composer is included to help you drag and drop your elements around your layouts as you wish. Useful modern features such as the Download Resume button will make the right impression on prospective employers across many fields and industries. Beautiful portfolio capabilities and utter responsiveness ensures your works reach the ends of the earth, looking sharp and Retina ready. Try Morgan today, and let yourself get the chance you’ve been waiting for! Werkstatt is a sleek and responsive WordPress creative portfolio website theme. Werkstatt is a perfect tool for businesses and professionals to set up handsome websites. In a matter of minutes and without any coding Werkstatt can achieve professional results. You can use Werkstatt’s powerful admin theme settings to shape your pages with ease. With the Visual Composer you can drag and drop your elements into action without breaking a sweat. Deploy sophisticated capabilities in a matter of seconds and customize them at your leisure. Professionals love Werkstatt as a platform for their vCard websites. With a broad range of portfolio tools, showcasing their capabilities and skills is easy. Stunning layouts and templates let you make the right first impression every time. Smooth hover effects and seamless hover animations keep people engaged. Your audience will connect with your professional resume in a memorable way with Werkstatt. Optimized for SEO, your vCard website will get noticed in no time at all. Werkstatt has handsome custom social media integration features. You can market yourself and your servies across social media very effectively. Fully responsive, Werkstatt plays nice with devices and platforms across the board. Reach a broader audience, with Werkstatt at your side! Squareroot is an amazing WordPress theme that can be used to construct impressive CV, freelancer or resume pages. First impressions matter, especially when you are considering online employment. With this theme, you are able to put your best foot forward, and impress potential clients. Squareroot is fully responsive and mobile-friendly. It has 4 variations for your home page and some backgrounds that can be personalized. In addition, there are 3 navigation styles and Font Awesome Icons. Using the personalization features, the user has an unlimited toolset at his disposal. You may alter the navigation styles and the backgrounds for each individual section. Colors, patterns and images can be modified. Every element of your website is well polished and serves its own unique purpose. Your resume resume will look amazing, thanks to the smooth Parallax scrolling. Enjoy the unparalleled level of creativity! It should be mentioned that Squareroot is very user-friendly, and that non-programmers can navigate its options with ease. The theme integrates over 240 icon fonts. These icons can be added to any section, via shortcodes. All of the features are explained in the detailed documentation that comes with the download. If any issues arise during installation, the customer support system will help you sort out the problems. Savannah is a well-made parallax WordPress theme perfect for creating a virtual business card or digital personal resume that could help you boost your business and build long list of potential clients. This one page portfolio WordPress theme allows you to show off your professional information, education, trainings attended, employment experience and portfolio. It is fully responsive and works efficiently on different kind of devices such as computers, smartphones, tablets and iPhone. Its design includes retina display graphics that makes your online resume standout. Its modern layout design is built based on Twitter Bootstrap 3 and designed using clean and valid HTML5 and CSS3 coding to help you keep pace with the latest trends in web design. Savannah offers a one click demo content importer and includes LESS files for advanced theme customization. It offers 8 predefined color schemes to complement your online branding requirements. The theme comes bundled with Visual Composer plugin that allows you to create unlimited page layout without difficulty. It also comes available with hundreds of Google web fonts, infinite color options, eye-catching social icons and layered PSD files. Grab the attention of your target clients and increase the interaction in your vCard or online resume with the theme’s fascinating scroll effects. You can also add other amazing visual designs to your personal website because the theme is powered by jQuery. In addition, the theme is crafted with parallax backgrounds and advanced HTML5 with sleek CSS3 animations. Another important feature of this modern vCard theme is its responsive Isotope portfolio that enables you to organize and present the samples of your work in a stylish way. The Isotope plugin integrated in the theme allows you to create unlimited superbly animated galleries with a modern look and fluid animations. With this functionality, you are able to set up new galleries, reorder groups and images through the drag and drop interface. Savannah also supports Contact Form 7 plugin to help you incorporate working forms to your vCard so visitors or interested clients would be able to communicate with you easily. Identity is a technologically cutting edge and graphically expressive and very well polished, extensively developed, professional and fresh-faced, youthful and brightly luminous, minimal and clean, aesthetically flexible and gracious, modern and attractive, functionally adaptable and very responsive WordPress multipurpose personal CV, vCard and portfolio website theme. Identity is a uniquely crafted WordPress theme, devoted exclusively to the deft and graceful presentation of professional, educational and related merits, activities, accomplishments and experience of individuals, firms or organizations to potential employers, clients or simply, the world at large. Identity is especially well suited for creative professionals, as its extensive graphic customization and configuration options are much appreciated by graphic designers, web developers, app developers, photographers and artists, allowing them to present themselves to the world in their own terms and offering a full scale of visual branding and website identity choices that truly put your creative expressive potential out there for the public to admire and appreciate. Identity has a host of specific, advanced and top of the line HTML5 vCard options, including sophisticated handling of video and other media content and seamless vCard integration, significantly expanding the possibilities for modern vCard presentations and ways to catch the eye of potential new business. Get your Identity straight, today! Personage is a trendy, feature-packed and user-friendly WordPress theme perfect for creating an impressive virtual business card or online resume. Whether your visitor prefers to use their computer, tablet or smartphone, your website will still look awesome on any devices and screen sizes because it is fully responsive and designed to rescale intuitively on any platforms it is viewed on. Personage is also created with sharp retina graphic elements for best display on HD devices and retina displays. Personage is a decent business card theme that comes available with multiple design options with unique theme features. The enormous white space, fluid design and astounding animation affects makes your personal and business information become more noticeable and memorable. Personage is custom-built to highlight your professional background, which includes your skills, work history, portfolio and testimonial of previous clients. The theme also comes with 600+ beautiful icon fonts in your website and unlimited color options that you can effortlessly modify through the admin control panel. The dumb-proof control panel gives your website unlimited design possibilities and allows you to tweak the essential elements within the theme. Personage has a print button on top of resume section that enables you to print your resume in a clean and beautiful style, which allows your prospective employers or clients to easily get your resume on file. Most aspect of this magnificent them are also animated so your visitors could have an awesome experience visiting each time they visit your website. And to spice up your vCard or online resume, they allows website template users to set either a full background video player or attention-grabbing background photo slider to impress and engage your visitors. The theme is designed using valid code and built with best SEO practices in mind to help your website rank well on search engine. Lastly, set up your own vCard by using the import demo content with just click! Are you looking for a minimalistic and versatile WordPress theme for your next project? You may consider buying Lambda WordPress theme. Lambda is a clean and stylish theme that you can use for building different kinds of website for resume, corporate, business, personal, photography and portfolio. This theme enables you to build a website in a jiffy using the theme’s one click demo installer. Its strong and bendy framework is developed based on the newest Bootstrap technology that enables you to quickly build smart and mobile optimized website. This theme is developed using valid HTML5 and CSS3 techniques to help you stay abreast of the latest trends in website design. This theme is absolutely responsive and resizes intuitively on any types of devices. This theme is packed with useful features and customization options such as unlimited color scheme options, unique skin editor, great Google Fonts and TypeKit support, built-in Font Awesome icons, and infinite header options. Lambda comes with a drag and drop functionality powered WP Bakery Visual Composer. Likewise, this theme is fully integrated with Revolution Slider, a powerful WordPress plugin that you can utilize in crafting animated slideshows for your inimitable website. This theme also uses WordPress Theme Customizer that lets you configure theme elements with ease. This theme is bundled with Isotope Gallery plugin and offers unlimited blog options. The social icons with Twitter widgets included in this theme, give website users a great opportunity to promote their content on different social networking platforms. Gone are the days of physical resumes and vcards. In today’s digital age, a website will represent you, and your company. Sanabel is a stellar vcard/resume WordPress theme that can improve every feature of your page, helping you to impress potential employers or clients. It has some very useful option for typography customization, as users are able to modify fonts, text colors, text styles, line heights, and font sizes. Employers will often give bonus points for the implementation of customized typography. It shows that you care enough to make the extra effort. With this vcard/resume theme, you will be able to incorporate unlimited side bars on any page. In addition, Vector Icons can be used. Sanabel has added an extensive documentation source that explains every single detail regarding this product. For new users, this feature is extremely useful. Site headers have 6 distinct variations, and there are 11 gorgeous footer layouts. Organizing widgets has never been easier. You will no longer need short codes while personalizing each page, thanks to the Visual Composer premium plugin. This wonderful tool uses drag and drop technology. Users only need to click on an element, and drag it to where it needs to be. It’s that simple!It should also be mentioned that the Layer Slider and Slider Revolution premium plugins were included, free of charge. Blade is a serious and professional, elegant and refined, strongly built and very reliable, technologically savvy and very user intuitive, flexible and highly customizable, modern and engaging, appealing and innovative, well-structured and memorable responsive WordPress multipurpose business theme. Blade is a theme that has been decked out with the ample strength and malleable features required to muscle the demands of a whole host of website applications, and while its polished and pristine design make it a natural fit for business or corporate users, Blade truly excels when deployed as a vCard WordPress website theme. If you are a professional of any field or industry, and are looking to make a strong and long-lasting impression on your potential customers or employers on a world-wide scale in a stylish, elegant presentation that truly makes a dent both in memories and in your business, Blade is the theme you need. With sophisticated Parallax visual effects and smooth scrolling, your vCard will stand out from the crowd in an understated yet boldly effective fashion. Blade is powered by the Redux Framework, putting all the power in the world in your hands to customize every element of Blade easily and without any need for coding, while its native responsiveness will ensure visitors on every platform can enjoy your website in top notch visual quality. Electric is the first, and the last theme that you will ever need to buy. It is a complete package, offering a diverse roster of features that allow it to adapt to any niche or situation. However, unlike other multipurpose themes, it somehow does not suffer from a lack of depth or complexity. Electric is designed in order to be accessible. Complex actions are reduced to child’s play, thanks to the inclusion of amazing plugins and a streamlined, well-written code. If you lack experience with web development, you can easily consult the comprehensive theme documentation source. If you prefer a more visual medium, informative video tutorials are available as well. Customers will also benefit from a lifetime of free developer support, once a purchase is finalized. The customer support representatives are friendly, and eager to help. Electric has over 10 different versions of portfolios. A more detailed post can be displayed as two individual pages, or in two distinct pop-up styles. Single Services and featured Services pages will incorporate amazing Parallax effect, adding another layer of depth to the browsing experience. The Mega Menu Builder can feature a variable number of tags, pictures and links. In addition, a versatile Form builder was added. Premium Layers is a smart WordPress theme that showcases your professional information without all the bells and whistles. It is very simple and straightforward to use. The theme’s plain design gives the developer greater freedom to style and personalize the theme that suits their branding requirements. It has a fully responsive layout, which adjusts smoothly on any types of devices. You can pick from its 8 preset skins, choose between dark and light schemes, use several animation effects and make the most of the Font Awesome icons bundled into the theme. Premium Layers also includes an incredible navigational menu that helps visitors explore your website with ease. Premium Layers comes with a boxed layout design which clearly define the boundary of the main body of you site, which is recommended for people who are starting out. This kind of layout design allows users to concentrate on copy creation and steer clear of unnecessary design element. In addition, more visitors tend to convert to clients with a boxed layout because they get easier access to your main content. 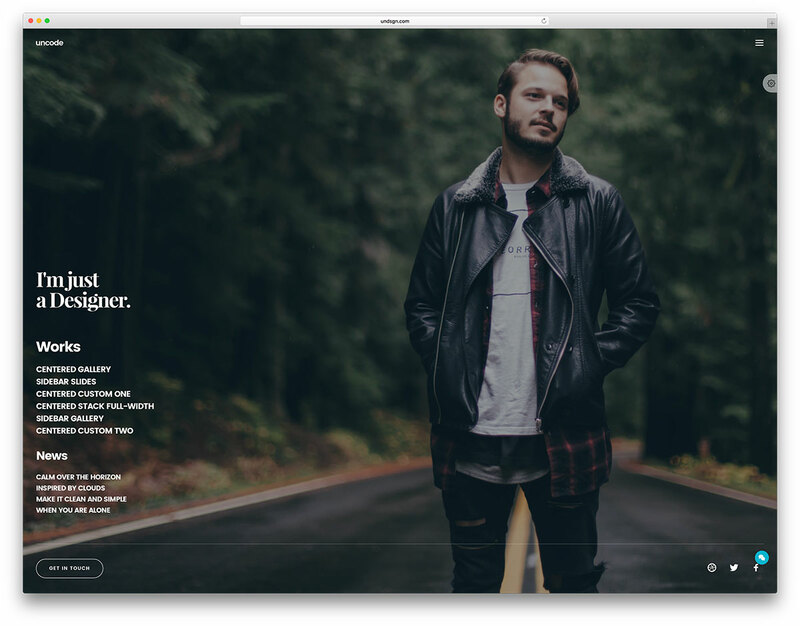 In addition to its functional layout design, Premium Layers has a filterable portfolio that helps you create, manage and publish a brilliant portfolio that can be filtered using smooth animations. This functionality also enables you to add effects and animations to make your portfolio look more attractive and engaging. The theme also comes with working PHP contact form and fully integrated with Google Maps to help you reach out to your potential customers. Its fully optimized code ensures that your website will work efficiently and perform well on search engine. cvCard is minimalistic vCard WordPress theme that will surely catch the attention of any possible employers or clients that may chance upon your website. This theme is superfine website template that responds fittingly to any devices it is viewed on. It looks beautiful even on screens with high resolution because it is retina ready. cvCard is WordPress 4+ compatible and coded with valid HTML5 and CSS3 for easy website development process. The theme’s low key design allows you to showcase your talents, skills and work with sophistication. Additionally, the minimalist design of the theme gives you enough room to personalize the website template. You can use cvCard as a single page or multiple page portfolio sites. You will be delighted by the number of theme features and options included in this smart theme. You can choose between dark and light schemes, choose among the 6 color options available, experiment using 400+ icons of fontawesome and many more. The theme also includes custom shortcodes that speeds up the process of building your professional profile on the web. You can take advantage of its broad and extensive slider and greet your visitors with a vast image that represents your personal brand or business. If you are not completely satisfied of how your vCard looks, you can tweak certain theme elements through its powerful theme options panel to add a personal style to your website design. cvCard’s smooth CSS3 transitions will give your website a splendid transition effect that will certainly wow your users, enhance engagement and boost your conversions. The website template has an awesome blog support that will help you reach out to your visitors, fans or followers and even establish readership to your personal website. And with its social media integration, you are also able to easily promote your vCard and get the word out. The theme also include a custom contact form, Localization ready, tested and compatible to all major browsers and specially built for efficiency.